GIVE US YOUR BEST KISS! That is what legendary rock band KISS and the fast-growing PBR will be asking millions of fans at Professional Bull Riders events across the country beginning this weekend at the nationally televised Last Cowboy Standing event from Mandalay Bay in Las Vegas. Today, PBR and KISS announce a partnership that brings together two powerful and iconic brands in a fan-focused alliance that will delight and entertain. PBR and KISS have teamed up to create the 8-Second KISS Kam, an innovative twist on the long-standing tradition in many sports venues where couples in the audience are highlighted on the large, in-venue video screens and encouraged to engage in a public display of affection. 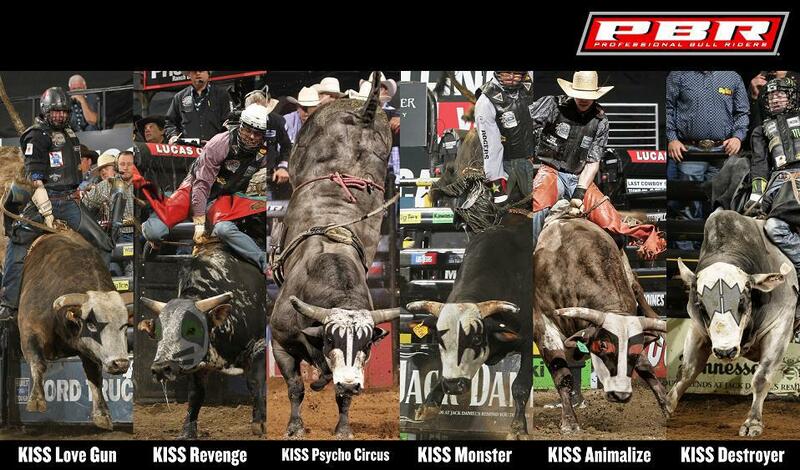 In typical PBR and KISS fashion, the innovative KISS Kam has a twist. Just like a successful bull ride, our participants are timed with a digital clock and must kiss for 8 seconds or face the ridicule of tens of thousands of PBR fans. Band members Paul Stanley, Tommy Thayer, Eric Singer and Gene Simmons cheer fans on and provide constructive criticism via video during the promotion. Videos from the 8-second kissing couples will be recorded and posted online at http://www.pbr.com/KISS">www.pbr.com/KISS where visitors can vote for the best (or worst) kiss and register to win valuable PBR and KISS prizes. Is there a MONSTER in the house? In support of KISS’s new MONSTER album and other great albums from the past 40 years, there are half-a-dozen new MONSTERs in PBR arenas nationwide. 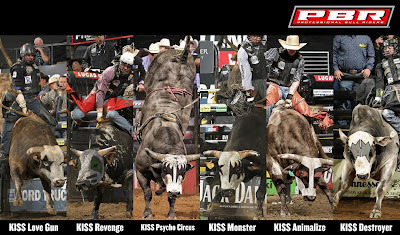 PBR and KISS have teamed up to name six world-class bucking bulls after KISS albums; KISS Monster, KISS Destroyer, KISS Animalize, KISS Revenge, KISS Love Gun and KISS Psycho Circus. These top-ranked animal athletes will face off against the Top 35 bull riders in the world at prestigious Built Ford Tough Series events for years to come. The PBR’s Built Ford Tough Series features 26 events across the country from Madison Square Garden to Cowboys Stadium to Anaheim and points in-between. All Built Ford Tough Series events are televised nationally on CBS and CBS Sports Network. The collaboration between PBR and KISS will officially launch Friday, May 10, when both the KISS Kam and bulls from the KISS team will be unveiled at the prestigious PBR Last Cowboy Standing event held at the Mandalay Bay Events Center May 10 and 11. The event is nationally televised on CBS on Saturday, May 11 and Sunday, May 12 from 4 p.m. to 6 p.m. ET. “And that’s no BULL….” Added Gene Simmons. This relationship will introduce KISS to a new, passionate audience that has been entertained at PBR events by KISS’ music for many years. PBR’s adrenaline-packed, bull riding-only events are wrapped in a rock concert environment with plenty of pyrotechnics and fire, a hallmark of the hottest band in the world. The PBR is the world’s premier bull riding organization. This year marks the 20th anniversary of the founding of the PBR. In just two decades, the dream of 20 bull riders has become a global sports phenomenon that reaches more than half a billion households in 50 nations and territories worldwide. Its primetime programming, produced by 34-time Emmy® Award winner and Peabody Award winner David Neal, airs domestically on CBS and CBS Sports Network. More than 2.5 million fans attend live events each year. The PBR has awarded more than $120 million in prize money and 25 riders have earned more than $1 million, including Justin McBride with $5.5 million – the most of any western-sports athlete in history. For more information on the PBR, go to PBR.com, or follow on Facebook at Facebook.com/PBR, Twitter at Twitter.com/PBR and YouTube at YouTube.com/PBR.